Luna Sensation is a combined new-generation SDHI and strobilurin fungicide for protected strawberries. It improves fruit quality and prolongs shelf-life for higher yields with less waste. How does Luna Sensation work? A spray fungicide for control of foliar diseases and fruit rots in protected crops of strawberry. Luna Sensation is broad spectrum. It’s proven among growers in Europe and recommended for all major fungal leaf and fruit rot diseases, particularly powdery mildew and Botrytis. Its active substances – new fluopyram and trifloxystrobin – offer a dual MoA (mode of action) with complementary activity and bioavailability on most stages of fungal growth. In addition, of course, that means resistance management is built in. For maximum effectiveness, Luna Sensation is best used as a preventative treatment in an integrated disease control programme with current standards such as Teldor and Serenade ASO. In addition, Luna Sensation has just a one-day PHI (pre-harvest interval). The video below shows that Luna Sensation keeps fruit looking good throughout the food chain, especially until it reaches the consumer. Protected crops can be highly susceptible. Initially, powdery mildew attacks younger leaves, reducing yield potential. It can also be found on flowers and fruit and is most damaging during warm and humid weather without excess leaf wetness. Potentially affecting all parts of the plant above ground, Botrytis is most commonly seen as a fruit rot that causes losses during storage. It typically infects during flowering and flourishes in warm, humid conditions. Caused by Rhizopus and Mucor, soft rots mainly result in significant losses during storage but also on ripe fruit in the field. It is, however, very difficult to differentiate between the two diseases. Luna Sensation reduces disease on mature leaves and protects new growth. Luna Sensation delivers consistently strong performance. Luna Sensation shows efficacy against Rhizopus and/or Mucor. Fluopyram is a unique member of a new set of SDHIs. It’s in a different chemical group from all others, and so has different properties with a molecular shape that gives greater flexibility leading to a different spectrum of activity and resistance profile from all other SDHIs. Applied before leaf infection, fluopyram inhibits germination and germ tube elongation. Applied after infection, it inhibits fungus growth on the leaf surface. A protective application of fluopyram prevents spore germination and development and elongation of the germ tube. New to soft fruit, trifloxystrobin uses strong contact and translaminar action to deliver robust, reliable control, leading to higher yields. Luna Sensation is recommended for control of a wide range of fungal diseases on protected strawberries. For best disease control and yield benefit Luna Sensation should be applied as part of a protective programme starting from first flowering. Based on limited data the control offruit rot, leaf blotch and petiole blight (Gnomonia comari = Zythia fragariae [anamorph], Gnomonia fructicola (Arnaud) Fall), plus reductions in post-harvest soft rots caused by Rhizopus stolonifera and/or Mucor piriformis and blue mould caused by Penicillium expansum would also be expected from applications of Luna Sensation applied in accordance with the crop specific information section. Botrytis and fruit rots: spray as part of a protectant programme from first open flower (BBCH 60) until fruit harvest (BBCH 89), respecting a pre-harvest interval of 1 day. Apply with good coverage on flowers and fruits before spores germinate. Powdery mildew: Apply as part of a protectant programme, no later than at first sign of disease. Do not apply with adjuvants (e.g. penetrants or spreaders) or phosphonates/phosphites as their use can enhance uptake of active substances, which can, in some instances lead to phytotoxicity symptoms. Bayer programmes with Luna Sensation are effective from the start and throughout your rotation. However, ideal application timings depend on disease levels, crop growth stage and other agronomic activities such as harvest timing. Discuss with your advisor to determine the best programme for your crop. Apply as part of a protectant programme, no later than at first sign of disease. For indoor use on peppers and chilli the maximum spray concentration must not exceed 0.023 kg active substance per hectolitre (100 litres). For use on peppers and chilli treatment must only be made under ‘permanent protection’ situations which provide full enclosure (including continuous top and side barriers down to below ground level) and which are present and maintained over a number of years. Reasonable precautions must be taken to prevent access of birds, wild mammals and honey bees to treated crops. To minimise airborne environmental exposure, vents, doors and other openings must be closed during and after application until the applied product has fully settled. The use of this product in recirculating water systems in a glasshouse may result in dilute pesticide waste that requires disposal. Luna Sensation applied with direct exposure to 10x female adults (and nymphs of Orius) at 0.8 L/ha in 400 L/ha. Assessed 24 hours after exposure. 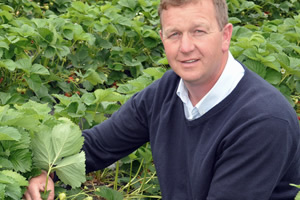 H & H Duncalfe, Maltmas Farm, Wisbech, Cambridgeshire, are members of Berry Gardens, the UK’s leading berry and stone fruit production and marketing group. “We’re very excited to have brand-new chemistry in Luna Sensation. With existing options fast disappearing, resistance is inevitable at some stage. New chemistry can help us combat this issue. Waste reduction is also an important topic and it’s very useful to have a new product that helps us avoid unnecessary waste throughout the chain. Produce has to be perfect when it reaches the consumer. That’s why, as well as tapping into industry trials, we’ve conducted our own. In these, Luna Sensation has been particularly impressive under high-pressure conditions, giving an excellent visual finish and improved shelf-life. Powdery mildew and Botrytis are both important problems in protected strawberries. We carried out an eight-day cold storage trial and saw no Botrytis develop – a remarkable result that confirms Luna Sensation’s ability to increase marketable yield. 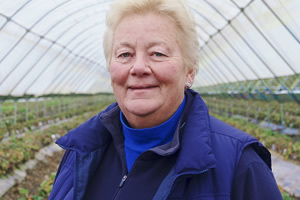 Wallings Nursery, Lawford, Manningtree, Essex, is a commercial grower of strawberries in polytunnels and glasshouses. They are part of the Fresca Group. “At Wallings Nursery, we grow 60-day varieties such as Centenary and Sonata, which are susceptible to powdery mildew. We tend to plant in August and harvest from October, pushing the crop right up to Christmas. Our advisor, Kevin Workman of Agrii, encouraged us to trial Luna Sensation and we found it arrested powdery mildew very well, with a second treatment later in the season. We’d normally expect to see post-harvest soft rots caused by Rhizopus and Mucor, but saw no evidence of either. Botrytis is less of a problem, as our plants are off the ground with good airflow. Luna Sensation also suits us because it has a short harvest interval, an advantage that few treatments offer. In fact, it’s good to see something new for everyone – a very promising product with broad-spectrum efficacy from a new chemistry group. A.J and C.I Snell, Harewood End, Hereford, incorporates Pencoyd Court Farm which produces high-quality fresh berries over 450 acres of Herefordshire countryside. The company grows for Berry Gardens. “The introduction of Luna Sensation is highly welcome, as it promises to add to our armoury for powdery mildew and Botrytis. 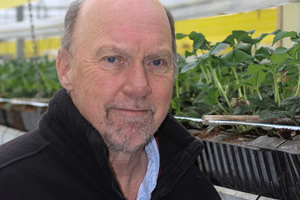 We need to control both these potentially devastating fungal diseases, especially in our ever-bearer strawberry crops, where the harvest interval is tight and the disease window is wide. In 2015, we hosted a Bayer replicated trial on our farm and Jonathan Blackman, Horticultural Technical Manager at Hutchinsons, noted Luna Sensation’s excellent control of powdery mildew in particular. In addition, Luna Sensation gave class-leading control of Botrytis compared to products already on the market. This was demonstrated clearly in shelf-life tests carried out by Bayer at ambient temperatures. Following the trial, and with Jonathan’s advice, we’re confident that Luna Sensation will give us robust powdery mildew and Botrytis control. It can be incorporated into our existing fungicide programme, which includes the Bayer biofungicide, Serenade ASO. Luna Sensation contains fluopyram, a member of the Succinate DeHydrogenase (SDH inhibitors) cross-resistance group and trifloxystrobin, a member of the QoI cross-resistance group. Use Luna Sensation as part of an Integrated Crop Management (ICM) strategy incorporating other methods of control, including where appropriate other fungicides with a different mode of action. Do not spray more than 2 applications of Luna Sensation in any one season. The possible development of disease strains resistant to Luna Sensation cannot be excluded or predicted. Where such resistant strains occur, Luna Sensation is unlikely to give satisfactory control.